This is a book written by someone who is in love with Hindi soundtrack music, and it shows in this short but very readable book. There are several good things in the book. Firstly, it is short enough that it can be read from start to finish in one sitting. Given that a book on such a topic could well become an encyclopedic work, it is a commendable effort that the author is able to keep it to under three hundred pages, which included some 26 pages or so of song listings, and (I think) an eight page index. Second, there are enough pages devoted to most of the major figures in the world of Hindi soundtrack music, composers, lyricists, and singers included. Inordinate material is not devoted to any single artiste at the expense of some others. Where material on some of the early singers, composers, and lyricists is either not available or easily accessible, this cannot be helped. Thirdly, there are interviews with Pyarelal (of the Laxmikant-Pyarelal composer duo), Gulzar, Lata Mangeshkar, and Manna Dey. The interview with Gulzar for example is a refreshing change from most of the interviews you would have read on Gulzar, where the man is asked endless times to speak on his association with the legendary composer RD Burman. In the book, he speaks on the other composers like Sahir, Shailendra (who he considers the greatet lyricist of the Hindi music industry), and others. He does also speak on his partnership with RD Burman. Fourthly, the book is neatly divided to make it easy to read thematically, or even chronologically. There is a section on composers, which itself is divided into four sub-sections, the second on lyricists, and the third on singers. Each artiste is devoted roughly two to eight pages. Expectedly, there are drawbacks and negatives also in this book. There are opinions in the book, that the author acknowledges as much, so that's a minor complaint with the book. Second, the book skims the surface of each artiste, but this again, considering the breadth of the book and the number of artistes considered, can probably overlooked. Thirdly, it is difficult to get a sense of any of the periods considered because the narrative is artiste focused. You would have to actually read the entire book and then collate the writing in separate chapters on different artistes to stitch some form of a sense of each of the periods, the decades, covered in the book. Fourthly, and deliberately so, controversies are neatly skirted. They are only alluded to briefly, but not covered in detail at all, nor their impact on the Hindi music industry analyzed. For example, the three year period when Rafi and Lata did not sing together in the early sixties, or when Raj Kapoor and Shankar-Jaikishan fell out for a brief period, or when SD Burman and Lata had a tiff and the former did not record any song with Lata for several years, and so on all had an impact on the Hindi movie music industry in some way or the other. These probably belong in another book. Read this book all at once, or in snippets, or skim through the book as you please. A good book for someone looking to get more acquainted with the Hindi music industry's history. Bollywood Melodies traces the evolution of the Hindi film song to its present status as the cultural barometer of the country, through an evaluation of the work of over fifty outstanding composers, singers and lyricists—from K.L. Saigal to Sonu Nigam, Naushad to A.R. Rahman, Sahir Ludhianvi to Javed Akhtar. Placing the song in the social context of the times, Ganesh Anantharaman looks at the influences that shaped it in each era: Rabindra Sangeet in the 1930s, the folk-inspired 1940s, the classical strains of the following decade and the advent of Western beats in the late 1960s. The author also chronicles the decline of music in Hindi films over the next twenty years before a new crop of musicians and singers gave the film song a new lease of life. Erudite yet lively, and including insightful interviews with icons like Lata Mangeshkar, Dev Anand, Gulzar, Manna Dey and Pyarelal, Bollywood Melodies is not only a treasure trove of information for music lovers but also an invaluable guide to understanding the nation’s enduring love affair with the Hindi film song. These are some books that turn up when you do a search on Amazon on this area. There are likely many more books, better and more comprehensive, that are out there. If buying in India, the prices are likely to be much cheaper. 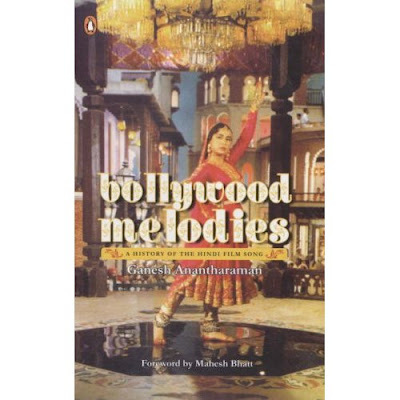 This book, 'Bollywood Melodies', for instance lists for $13.42 on Amazon, but its list price is Rs 295 (US$6.15 at Rs 48 to the dollar), and you can pick it up at a 10-20% discount from some stores.